Q: What is Revolution® (selamectin)? Q: How does Revolution® (selamectin) work? Revolution enters the bloodstream through the skin. Concentrations of Revolution in the blood and tissues prevent heartworm disease and prevent and treat roundworm and hookworm infections. 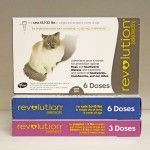 Revolution selectively redistributes from the blood to the skin and other tissues, where it provides protection against fleas, flea eggs, and ear mites. Contact Elm Point Animal Hospital today to order or to consult with one of the doctors regarding your pet and Revolution!